Hi Everyone! I'm just blown away with all the warm wishes for my little girl, Dottie! She's settling nicely in her new home with her 3 brothers, 'Jack', and my 2 sons Cody and Kyle :-) She loves to cuddle and sleeps close to us. She's an absolute LOVE DOG! Both her and Jack also like to nap together... She has been nothing but a joy to our family! ...And yes... I must admit, I do spoil her a bit! Don't you love her new pink collar with the paw prints?? So perfect for the girly-girl! Well, its back to work after a weekend of racing at NHIS ... but only for 2 days and then I'm off for the rest of the week - yea!!! It was definitely a lot cooler than usual for our July race - I'd even actually say we had some cold moments... but I'll take having to throw on a sweatshirt at a race anytime over the usual sweltering 100 degree days up at the track! See the video here... and yes, I did get some knitting done (working on my radiant lace headband) yesterday while tailgating before the race, see? Great early 4th of July news for Heather... Jason's home!!!! Yea! I know its going to be a wonderful Independence Day for that family! Tailgating, NASCAR and knitting what is not to love! So glad to hear Dottie is doing well. Looks like you had a great weekend yourself. I'm dog-sitting for my mom this week so peek over to my site you may see a few pictures of him later in the week. 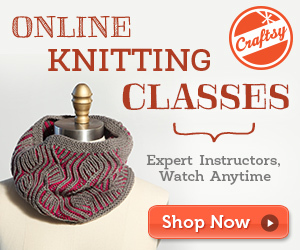 What a perfect thing to knit during hot weather. I knit a headband last week in VA, but gave it to Fay immediately when we arrived home. Glad Dottie is doing well. What a cute girl. I saw Heather's post this morning. How awesome is that for the family?! Hello! I'm your Virtual Vacation Swap partner!! Have really enjoyed reading your blog and am also an animal lover! Dottie is adorable and sounds as if she's found a great new home. I'll be checking in on you allll summer! Aw!!! How nice that Dottie is so loved. I love the headband and the color. Purple rocks.